At the Grand Finale of Miss Bolivia 2018 held on 23rd June 2018, five queens were officially sashed to represent Bolivia at five international pageants. 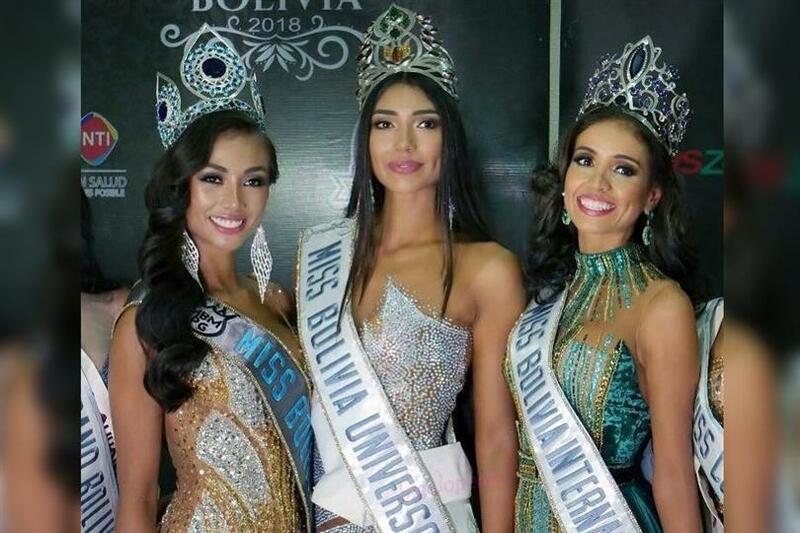 Joyce Prado was crowned Miss Bolivia 2018 who is the official representative of Bolivia at Miss Universe 2018. Miss Cochabamba 2018 Vanessa Vargas was crowned Miss Mundo Bolivia 2018 aka Miss World Bolivia 2018 at the end of the finale. She succeeds and was crowned by Miss Mundo Bolivia 2017 Jasmin Pinto. Vanessa will now represent Bolivia at Miss World 2018. Now new to the pageant world, Vanessa has had the opportunity to participate in other pageants in the recent years. She was Miss Feicobol 2017, Miss Fitness bikini 2016-2017, Queen Caporales San Simon 2015-2016 and Premier Girl 2014-2017. The 22-year-old Vanessa is a student of Architecture. She has numerous recognitions received in her sporting activity since she practices volleyball and was part of the Cochabamba Volleyball Team for four years. She stands 173 cm tall. Vanessa Vargas was also awarded the title of Beauty with a Purpose at Miss Bolivia 2018. Vargas believes that “When your goals have an end that goes beyond the superficial God knows and it is He who can guide you so that you open the doors that will lead you to reach them.” That’s quite an ambitious thought right there! Before the competition, Vanessa expressed that being Miss Cochabamba allowed her to have more contacts both for her profession and for community service, an activity that she likes to do and she is sure that Miss Bolivia is an important platform that can open many doors for her. With her win, she can definitely use her title to work more for her project to fight against cancer. Along with the Oncofeliz Foundation of Cochabamba, Vanessa will continue her work to raise funds for more than 300 sick children and raise awareness against this problem as she did before participating in the pageant. Along with Vanessa, Miss Andalucia 2018 Karen Quispe was awarded the title of Virreina Miss Bolivia Mundo 2018 at the finale night. What do you think of this newly crowned beauty queen? Let us know in the comments section below.